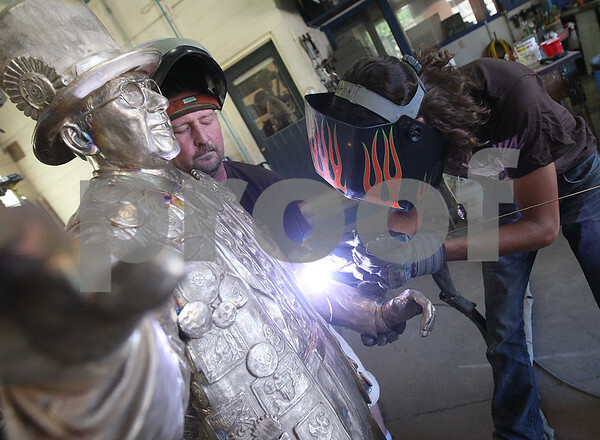 Fine art craftsman Ryan Hartman (right) welds Wally Thurow's left hand onto the statue while David Seagraves holds the registration points together at the inBronze studio in Mt. Morris on Wednesday, September 3, 2014. Owner Jeff Adams has been sculpting and casting bronze for almost 40 years. Adams said he expects the bronze casting of the statue to be completed in about three weeks. The statue of Wally Thurow, or "Mr. Pumpkin," as many knew him stands about six feet tall, with his high-wheeled penny farthing bicycle standing five feet tall.